As a retina specialist, I am always amazed at how a patient can have a problem with their vision and either ignore it, blame it on something else, or not seek immediate attention. There are clearly symptoms that need to be addressed immediately, others that can wait and even others that don’t need to be examined. In this article I will attempt to describe typical symptoms a patient may have and what the common cause is. Certainly do not use this article to diagnosis yourself but as a guide to know when to call and come in immediately to be examined, when it is okay to wait for a scheduled appointment, and when it is okay to wait to see if symptoms go away. Additionally, to save you a lot of time, in general, your Ophthalmologist should have someone on call for their office. If you have symptoms you are concerned about, I recommend you always start with a phone call to your Eye Doctor’s office – even on the weekends or at nights if you think it cannot wait. If there is significant trauma or a major accident, then heading to the emergency room is appropriate. If just ocular symptoms occur on their own, many times the Emergency Department doesn’t have the proper equipment or staff to diagnosis a complicated eye problem. They will end up calling the Ophthalmologist on-call, which is something you can do yourself without going to the Emergency Department. The following are symptoms that should be considered an emergency and should be seen immediately by an Ophthalmologist. Most offices are trained to know what symptoms require immediate attention. 1. Loss of vision after acute trauma to the eye. Blunt or sharp trauma to the eye can cause hemorrhaging inside and outside the eye, can cause the eye to be cut open requiring immediate surgery, retinal detachment, etc. 2. Significant pain or loss of vision after a recent eye surgery can be a sign of infection. This should be addressed immediately if there is a significant change in vision for the worse or a new onset of pain. 3. Acute total painless loss of vision in one eye only – this can be a sign of a stroke in the eye or a stroke in the optic nerve which is the connection of the eyeball to the brain. 4. Acute partial loss of vision as though someone is closing a dark shade over a certain part of the visual field. The shaded part of vision is significantly opaque and usually the shade is black, gray, or a deep dark color purple. This can be a sign of a retinal detachment. The following are symptoms that should be seen within approximately 24 hours. 1. New flashes of lights that usually occur at night or in the dark. This flash lasts for a brief second and usually comes from the side of the vision. It may recur frequently but only lasts for about second. This can be symptoms of a posterior vitreous detachment, retinal tear and retinal detachment. 2. New floaters (lines, small black dots, or hazy veil in the vision that floats back and forth) in the vision. If it is acute and occurs in one eye it is usually related to a retina problem. If symptoms are acute and bilateral (both eye affected) usually it is a systemic medical problem. 3. Significant eyelid swelling with pain and tenderness that is causing blurred vision. This can be a sign of a cellulitis that should be treated immediately to avoid turning into orbital cellulitis which can be sight threatening. 4. Tenderness and pain near the nasal aspect of the eyelid (near the nose which is where the nasolacrimal duct resides) associated with yellowish discharge. If you press on this area and pus comes out of the punctum and if there is point tenderness this can be a sign of dacryocystitis which requires immediate systemic antibiotics and possible surgery. 5. A contact lens issue where the eye is sore and tender, vision is blurred, sensitive to light and a possible foreign body sensation. This can be a sign of a contact lens related ulcer which needs to be treated immediately with antibiotic drops. Symptoms of things that can be seen on a more scheduled basis. Generally these are things that are chronic in nature and DO NOT have associated vision loss. Symptoms of things that don’t necessarily need to be seen or just require a phone call to the eye doctor. 1. Diffuse red hemorrhage in one quadrant or half of the white part of the eye. No associated pain or vision loss and no history of trauma. Usually this is just a subconjunctival hemorrhage that occurs spontaneously. 2. Noticing a white or pinkish fleshy growth on the white part of the eye. Sometimes can be itchy. Not associated with pain or vision loss. This is called a pingueculum that commonly grows due to excessive sun exposure. I have tried to summarize typical symptoms I commonly hear from my retina patients. Use this list as a guide to know when to call in to your Eye Doctor’s office and avoid unnecessary vision loss due to lack of action on your part! In addition remember to keep up with your routine eye exams for prevention and to keep your eyes healthy! 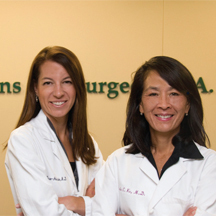 Dr. Carolyn Glazer-Hockstein and Dr. Paula Ko are retina specialists at Eye Physicians and Surgeons who are committed to helping patients with AMD and other retinal diseases. 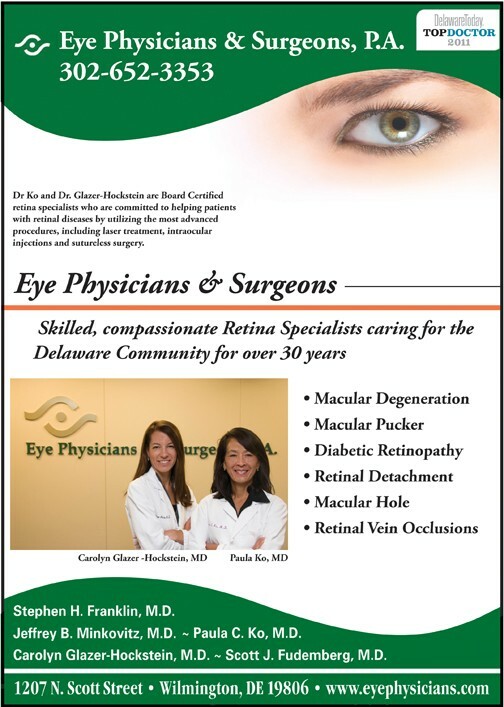 If you would like to learn more about AMD or to schedule an appointment call (302) 652-3353. Next Story → You’re So Vein!